Looking at my Sketchup model the thing I think would be the biggest problem is the arches on the back board. 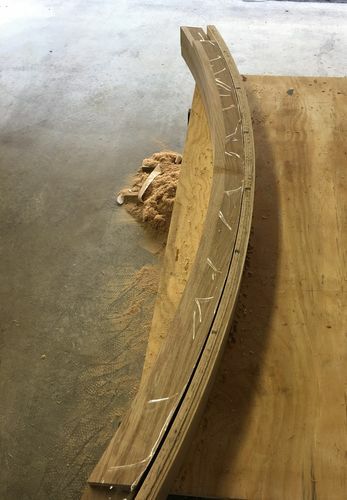 There are 2 curved boards, one curved molding and one Laminated board. I figure this is the best place to get started. The first thing I did was find the radius of the arch that I wanted to create. 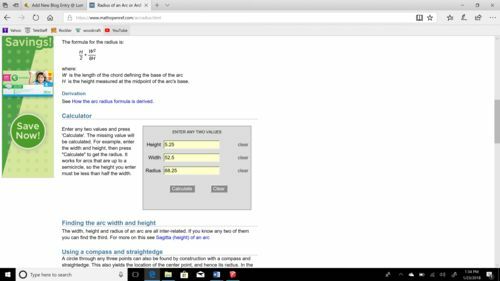 To do this I found an online calculator and put in the width and height of the arch segment I had. I came up with a 68.25” radius. Next I got some MDF to use as a template. 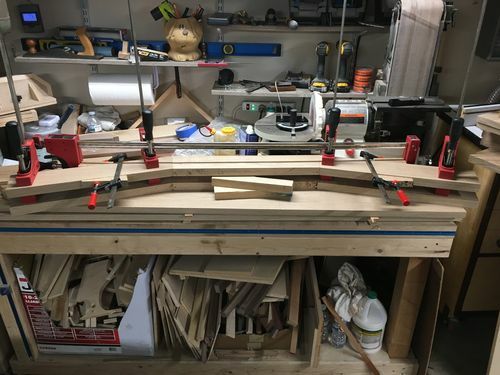 I attached my router to a long strip of MDF and used it to cut out a 68.25” radius curve over approximately a 59” segment just so I had a little extra on the sides. That gave me a nice templet for the top of the curves. Now I couldn’t just adjust the router to a different radius because all the curves are the same. They do not increase or decrease with the distance from the center. If that makes any sense. I wanted to make a negative template of my first, that would allow me to use it for the bottom of the arches. To do this I used the same technique that I saw in a Stumpy Nubs video. I basically followed the same steps I just used different router bit sizes. I couldn’t find a ¼” bit I was happy with, so I just used a 3/8” bit and then added a 1-1/8” bearing. Now I had a templet for the top of all the arches and one for the bottom. 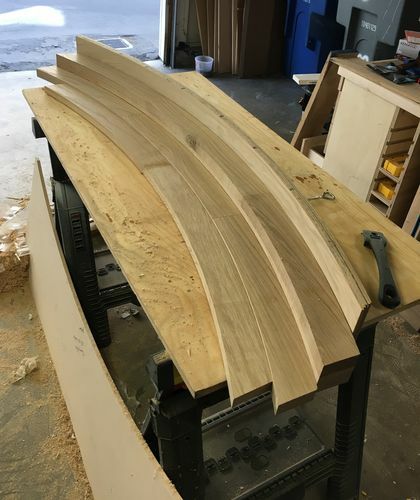 To save wood I decided to make the arches up from a few boards joined together with tongue and groove joints. The large molding, I made from 2 layers of 6/4 with three sections and 1 layer of ½ with two sections. I sandwiched the ½ in the middle to alternate the joints. This resulted in a board just slightly under 3” after jointing. I cut all the arches to 3” tall, including the molding. This allowed me to use the arches as a mold for the top lamination. The top lamination is made of up 6 ply for a total of 1” thick. 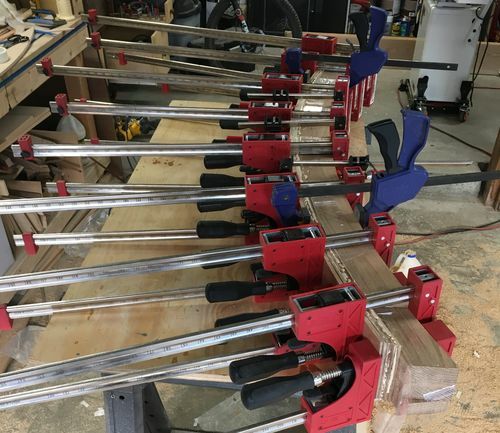 I used titebond II extend and most of my clamps. With this being my first lamination I am quite pleased with the result. There was very minimal spring back and I’m not concerned with that since I can just glue or screw it down. Overall, I am very pleased with the way the arches turned out. 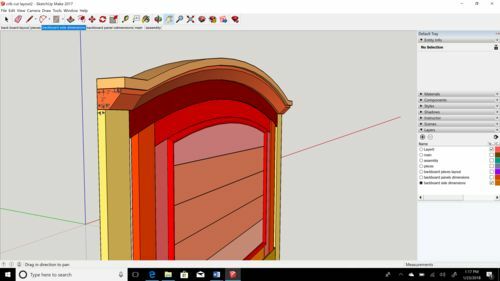 Now all I must do is cut an inch off of the molding because it is only supposed to be 2” tall, glue and laminate the thinner molding and cut the arch for the top panel and I will be done with the curves.